Good news... if you like vanilla and shredded wheat, I have a cereal for you. Ground vanilla beans actually appear 6th in the ingredient list for this cereal. The warmth of the vanilla partners with the toasted wheat to provide a full-bodied, satisfying flavor. Specks of vanilla bean swim enticingly around the spoon-size biscuit pieces to remind you what your eating. The bad news is for almond lovers. Despite appearing 3rd in the ingredient list, the flavor and texture of almonds gets completely lost in this cereal... I mean really lost. I would be surprised if anyone identified that this "vanilla almond" cereal contained almonds if they weren't already aware. In the case of Vanilla Almond Shredded Wheat, the good outweighs the bad. Even without a clear almond presence, this is a tasty cereal. The sugar content is a little higher than you might expect at 11 grams per serving. But the sweetness of this cereal acts to mellow out the whole wheat flavor and activate the vanilla flavor. I'm also happy to report that the cereal pieces retain their shape in milk. They don't break down into mushy strands as some shredded wheat cereals tend to do. In the end, this is a very good cereal. Unfortunately, I suspect Vanilla Almond Shredded Wheat had a shot at being better than "very good" had the flavor of almond lived up to the cereal's name. Nutritional concerns: Each 1 cup serving without milk has 190 calories, 1.5 grams total fat (0 saturated and 0 trans), 43 grams total carbs, 5 grams dietary fiber, 11 grams sugars, 45 mg sodium and 4 grams protein. What do you think of Vanilla Almond Shredded Wheat? Love, love, love this cereal. Wonderful for snacking & the smooth vanilla flavor is delicious! Not overly sweet and you still get the fiber! I can't find this... where can you buy it? Has it been discontinued? Post... please bring it back!!! It was my all time FAV... with some vanilla almond milk, some fresh blueberries, strawberries and banana - better than a banana split any day - HOW CAN WE GET IT BACK??? I am confused. Is Post making a new Shredded Wheat Vanilla Almond again or not?? 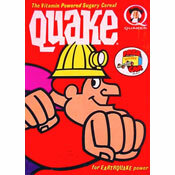 I miss this cereal plus I am getting so tired of eating a product that I like to get from the store on a weekly basis only to have it never seen again on the shelf because its now being replaced with some stupid combination like Shredded Wheats with blueberries inside or Pop-Tarts that are to taste like an ice cream sundae. Its breakfast time. Why do Pop-Tarts have to taste like a S'more. This is a superb cereal. It provides you with fiber and taste. The vanilla tones down the wheat flavor and it remains crunchy even when it is in the milk for a few minutes. Recently, I have had a difficult time purchasing it at Western PA grocery stores. It seems they keep taking the cereals I like off the shelf. Amazing! Not only great nutritionally but also good dry or with soy milk! Can't stop eating it once I start! Of all the cereals I've eaten this is the best. I love the marriage of almond and vanilla flavoring. I purchased this cereal for a while and then it disappeared. I've searched several stores and cannot find it anywhere. 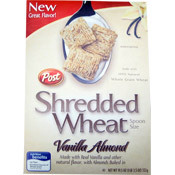 I love shredded wheat vanilla almond, but I haven't been able to find it lately in the stores, what happened? This cereal make for a fantastic snacking cereal. The flavor is mellow but much more than plain shredded wheat. Great mid morning snack. Hey Mr. Breakfast, you know I really love your work, and I've eaten a lot of cereal in my day. My usual favorites are life and frosted shredded wheat. I feel like the shredded wheat vanilla almond is like a perfect matrimony of the two. It's really everything I ask from a cereal -- the hearty taste (with whole milk), the satisfying crunch, and the sweet finish, courtesy of the vanilla almond taste. Kudos to you, Post Corporation! This totally switched my focus from mini-wheats to shredded wheat. All the shredded wheat flavors-lightly frosted, honey nut, wheat and bran- have something special about them. I love this the most though; it gets the sweetness just right. I really like this cereal! I'm not a fan of artificial almond flavorings, so was happy to see that it uses real almonds in the ingredients. Though the "nutty" flavor is not very pronounced, the vanilla flavor and warmness of the whole wheat make for a truly delicious flavor. Doesn't taste "too healthy" thanks to the added sugar - but packs in a nice serving of fiber. I highly recommend!